After a windy month on the reef and the weather on the improve, the fishing looks set to be an excellent light tackle season with good sized Spanish mackerel already on the bite and gathering around their winter time spots. The bait is everywhere and bodes well for good sailfish and marlin action. I’ve seen 1 tailing sailfish in the last 2 trips with little searching. Both to the North and East of Cairns, yakkas, gobbers and pilchard schools are thick. Spotted mackerel and roaming Spanish mackerel are biting from the 30 metre contour onwards. The mackerel range from standard 4kg models all the way to good sized 13-14kg fish. The islands and headlands have also produced some good mackerel so with calmer weather the local fishermen will be happy. 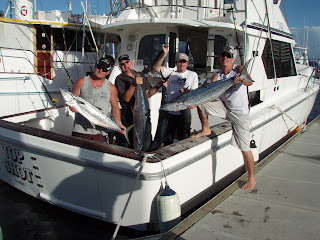 This ANZAC long weekend should be a great time fishing from Cairns although the neap tides may make the mackerel fishing a little tough with some sneaky tactics required.